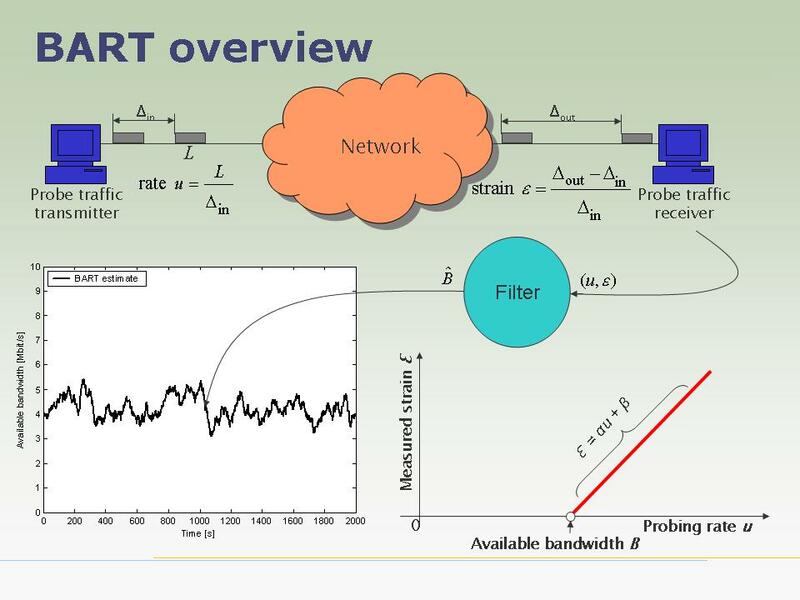 BART (Bandwidth Available in Real-Time) is a method for monitoring the dynamic available bandwidth of the path between a sender and a receiver in a packet-switched network such as the Internet. It requires software to run on the sender and on the receiver, but does not require any access to, nor prior knowledge about, the intermediate network nodes or the links between them. BART works by maintaining an estimate of the most relevant aspects of the network state, and by updating this estimate for each new sampling. 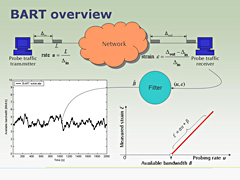 The sampling is carried out by studying the time dispersion in a pair or train of probe packets as a function of the probing bit rate, and the state update is performed by Kalman filtering. The resulting estimation method is configurably fast, reasonably accurate, computationally light-weight and tunable as to the time scale of interest for the application at hand. For further information, please visit http://www.barttool.org . For an overview presentation of BART, see BART@SICS2006.pdf .